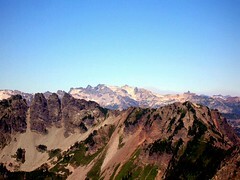 Mount Daniel and Alta peak. I have been wanting to do Daniel since I saw it from granite 4 years ago. Daniel is a fun and beautiful climb. I this a little of everything and many good routes. 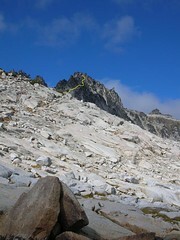 We chose the SE ridge route. Here is a pic of Daniel from Alta. Met Hichen at TH and started up around 7ish. Weather was perfect. no bugs at TH. Once we reached the little pond just below Peggy's pond we did a little cross country/bushwack up the ridge to the west of the trail to Peggy's. 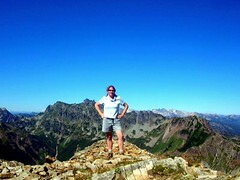 This took us up and above Peggy's to meet up with the climbers trail. I was starting to get warm out and the only bugs where black fies. Started up the SE ridge on a climbers track (one of many). We left the track several times as we traversed up to the top of the ridge. 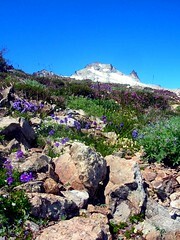 The heather and other flowers are full force around 7000'. Once we gained the ridge WOW what a sight. We could see all the way from Baker to Adams. 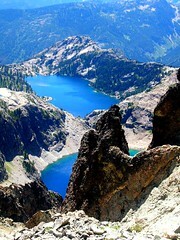 As we climbed up Lakes peaked out form everywhere. Ran into a couple of other climbers headed down and chatted a bit. We stayed on the ridge top (some class 3 stuff FUN! 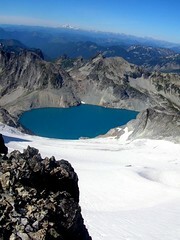 )till we reached the East summit. From here we traversed around the SW face of east peak through talas and scree. Clmb up a steep section of Talas and scree to reach the summit ridge. From there we could finally see our Goal. It seemed as if the ridge just went on and on and on. It was a piece of cake from here on. 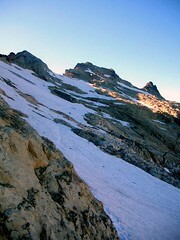 Just before gaining the summit we traversed through a small snow field, the only snow we touched on the way up. The summit register is full so if some one is headed up bring something with ya. We signed our permit and left it. We spent over an hour on top. The views where endless. 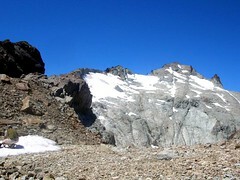 A couple of climbers that took lynch glacier where camped at top in a nice spot. BTW Lynch is in perfect shape for climbing right now! On the way down we chose to descend the top of Daniel Glacier to to the saddle NW of the East peak. Then we skirted back around the sw face of the east peak. From here we dropped down and traversed the snow fields to avoid all the ups and downs of the rest of ridge. Hichen boot skied down most o f the snow field. It was quite mushy by this time of day. Great climb out with the sun getting lower in the sky. Once back at the truck I was surprised with a gift from FS. a ticket! What a way to end the perfect day huh. I went to set up camp and Hichen headed home. All in all Daniel is a spectacular climb. used ice axe briefly but all snow can be avoided at this time. After breaking camp and driving to Rachel lake th I got started up the trail to Alta around 10am. Tons of people and flys on this trail. Saw a guy several times with a cat on his backpack. 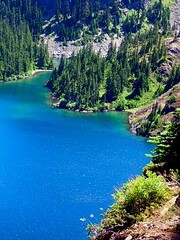 It was very hot and i was tired from the climb the day before but I still made good time to rachel lake. At Rachel I found a spot in the shade soaked my feet and took a nap. Then up the ridge I went. from Rampart ridge you can gain the summit ridge to Alta or go to the right and head over to lillian. I chose to head to lillian to take a look I knew i could get upi Alta from there. 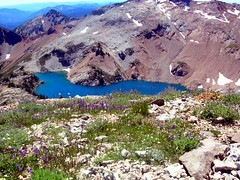 From The lake basin I went cross country up to the summit ridge to Alta. This is where i was running out of steam. It was 92 degrees according to my altimeter. too friggin hot. Got to the summit took some pics and retreated to some shade. This is a easy fun scramble as a solo. Views are grand. This was supposed to be a relaxing trip with five friends on the Northern Loop at Rainier but the weather forecast for the weekend was not looking good at all. After two people backing out and too much back and forth trying to figure out who wants to go where, we finally said screw it and picked the Enchantments and hoped to get a permit. Come to find out, it would have been fine at Rainier. Denise and I picked up permits at the rangers station and met Jeff at the TH. We hiked up to the intersection of the Stewart Lake trail. We dropped our packs off in a cubby and headed to the lake. Jeff took a dip in the lake. Brrrrr! 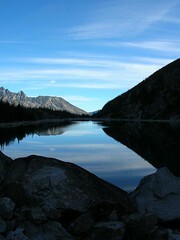 Then we headed up to Colchuck Lake for camp. We camped on a beach just under Aasgard Pass. It was a good day the weather started out a bit cloudy but it cleared in the afternoon and we had a great sunset. In the morning the sunrise was nice as we got ready for the day. We headed up Aasgard. I was surprised to find it was not all that bad. I hear a lot of talk about it being hard but it was much easier than what I had climbed lately so it seemed to be a cake walk for me. We took a break at the top around the first lake you come to. 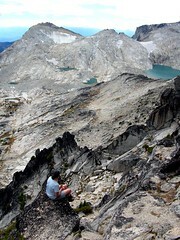 This is where Jeff and I would head up the ridge to climb Enchantment peak. AB stayed in the basin to poke around and enjoy. She will fill you in on her time in the basin. 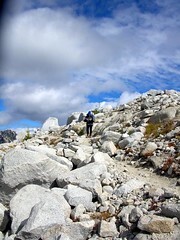 Jeff and I headed up a ridge running SW to the Enchantment peaks. Jeff got to within 10' of the summit and I got within about 20'. We could see the route to get to Enchantment by now. However; we still had to meet up with AB down in the basin so we had no time to climb down and find our way to the ridge to summit Enchantment. We found a great ledge to sit on and have a snack and snap some pics. The views where incredible from this spot. 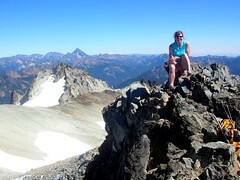 I was disappointed we didn’t have time and did not reach the summit of Enchantment peak (or the summit ridge). I had a great time climbing the crags and was quite happy with the climb we did. Jeff was disappointed about not summiting Enchantment and made it known . Things happen sometimes and it doesn’t always work as planned so you work with what you have. After descending and getting to the basin it was time to look for AB. After much searching we found her in the upper basin. We all found a good spot to sit and have a late lunch and enjoy the surroundings. This was my first time here and I loved it. We finished our lunch and headed back to Aasgard. 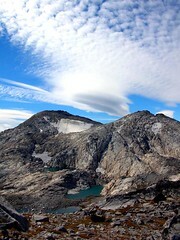 The weather was good all day till we started down and we could see a storm cloud in the valley above Colchuck lake. It looked as though it would be above the lake soon but it just kind of spit some snow and sprinkles at us and by the time we got to camp it was clearing. That night at camp we played frisbee with a titanium lid. And watched the sun go down. The temp got down to 28-29 degrees that night. It was crisp and clear and I loved it! The next morning Jeff headed out early while we stuck around on the beach in our sleeping bags to watch the sun come up. AB Had a hard time the first 2 miles out cause she has two monster blister on her heals . Once she decided to stop and doctor them up she was moving better. From the half way point she was all speedy and we made it out to get some good burgers at Gustav’s. It was a relaxing, funny trip with two very fine, awesome people. Thanks guys! Hopefully they will tell you of there own experience. I was impressed with the basin and will be back with more time to get some good photos. Yes, next time I will haul the stupid pack to the top and stay in the basin.